Pittsburgh Mayor William Peduto hit back at President Donald Trump’s comments that officials should increase armed security in the wake of mass attacks. Pittsburgh Mayor William Peduto hit back at President Donald Trump’s comments that officials should look to increase armed security in public places in the wake of mass attacks. 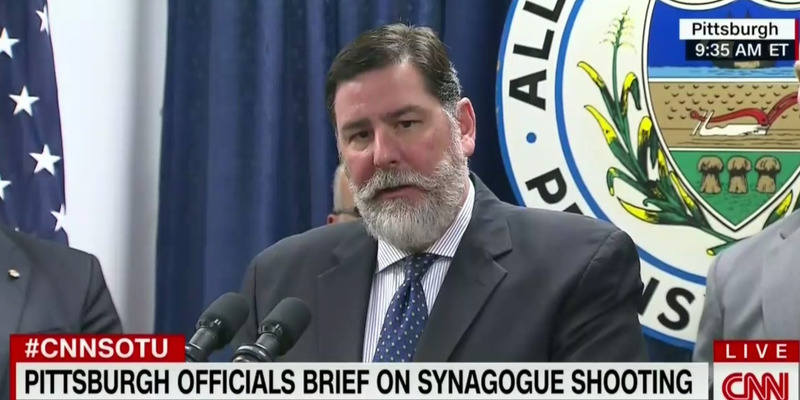 After a gunman killed 11 people at a Pittsburgh synagogue Saturday morning, Peduto told host Chuck Todd on Sunday’s “Meet the Press” that officials should confront “irrational” individuals in creating proactive policy. Officials confirmed the shooting suspect was 46-year-old Robert Bowers, who shouted “all Jews must die” while opening fire Saturday morning, according to Pittsburgh CBS affiliate KDKA. When Trump responded to questions from reporters Saturday afternoon about the attack’s potential effects on gun policy, he said gun control laws had “little to do with” the shooting. During a Sunday morning press conference, Peduto doubled down on his comments about gun policy when asked, saying officials should look to make plans to directly control access to guns. 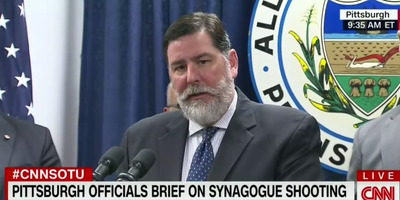 “We should take the guns, which are the common denominator of every mass shooting in America, out of the hands of those looking to express hatred through murder,” Peduto said. Peduto has tangled with Trump before, shooting back on Twitter when Trump said he was “elected by voters of Pittsburgh” in a statement that declared his decision to withdraw from the Paris Climate Agreement.